It’s a joy to reserve this part of the year to remember and celebrate the birth of our Savior, the Lord Jesus Christ. This, of course, is what Christmas is about in the truest sense. Amid all the tinsel, the gingerbread cookies, and the trees and stockings and gift shopping, true Christians pause to reorient our thoughts and our affections to what Christmas is really about: the incarnation of the Son of God. God. Becoming man. The infinite, eternal, self-existent, self-sufficient, almighty God, without shedding His divine nature, taking upon Himself—in addition to His divine nature—a human nature—truly becoming one of us. In the incarnation of the Son of God, it can properly be said that the immutable, unchangeable God became what He wasn’t, while never ceasing to be what He was. The incomprehensibility of that thought alone is sufficient to bow our hearts and intellects before divine wisdom in worship. This kind of mind-bending wisdom is so lofty—so far beyond our natural understanding—that we wouldn’t believe it if Scripture didn’t teach it so plainly. We already referenced John 1: The Word was God, and the Word became flesh. We also see it in Philippians 2:6–7 , where Paul tells us that while Christ was existing in His very nature as God nevertheless assumed to Himself the very nature of a servant, and was born as a man. You see, the Lord Jesus Christ did not come into being at the incarnation; He existed for all eternity as God Himself—the Second Person of the Holy Trinity—God the Son. And so as God, He fully possesses all the attributes of God: infinity, eternality, omniscience, immutability; everything that properly belongs to the nature of God the Father belongs to the nature of God the Son, for they share the very same nature, the same essence, the same being. And yet, God the Son became man! Again, becoming what He wasn’t while never ceasing to be what He was. The Irish Reformer, James Ussher, said of the incarnation that it is “the highest pitch of God’s wisdom, goodness, power, and glory.” Pastor and author, Mark Jones, said, “The incarnation is God’s greatest wonder, one that no creature could ever have imagined. God himself could not perform a more difficult and glorious work. It has justly been called the miracle of all miracles” (Knowing Christ, 25). If we’re honest, and if we can slow our minds down and turn our thinking from the hustle and bustle of the Christmas season to truth, we’re forced to admit that there is a peculiar glory of this greatest of God’s miracles—that, among all the amazing works that Almighty God has accomplished in this world, the incarnation has a special luster of magnificence. And I think the reason for that peculiar glory is that the incarnation takes two things of an infinite difference and distance, and puts them side by side. The incarnation takes the infinite God, and the finite man, and unites them together in One magnificent Person. And it’s the juxtaposition of the majesty of God with the humility of man that renders the glory of the Lord Jesus—the glory of the incarnation—more especially brilliant than all other of God’s glorious works. Jonathan Edwards once preached a sermon on Christ as the Lion and the Lamb from Revelation 5, entitled “The Admirable Conjunction of Diverse Excellencies in Christ Jesus,” a title packed with significance. It is to say that in Christ, there is a joining together of attributes and qualities that are significantly different from one another, and this conjunction of diverse excellencies, Edwards said, is admirable. By its very nature, it evokes admiration. Praise. Wonder. Delight. Amazement. Worship. We struggle even to put it into words, but the conjunction of diverse excellencies in Christ is glorious. And there is no greater display of that glory than in the incarnation, because it is only by the incarnation that such a conjunction is even made possible. And so I want to briefly reflect on this admirable conjunction of diverse excellencies in Christ, to set these contrasting glories side by side. My hope is that as you meditate on these diverse excellencies, they will stir you to consider Christ in this Christmas season, in all His admirable glory as the God-man, the Word made flesh. Consider that the Sustainer of all things, who at all times upholds all things by the Word of His power (Heb 1:3 ), the One in whom all things hold together (Col 1:17 ), was Himself being sustained in the womb and at the breast of a Hebrew maiden. Mark Jones reflects, “Jesus drank from his mother’s breasts and Jesus provided his mother with the milk to feed him” (Knowing Christ, 32). Consider that the infinite God was clothed in finite humanity. The eternal (Micah 5:2 ; 2 Tim 1:9 ; Titus 1:2 ) stepped into time. The immense and omnipresent One who filled all space and time, whom the highest heavens cannot contain (1 Kgs 8:27 ), confined Himself to the single space of Mary’s womb, and then the cattle’s trough, and then Calvary’s cross, and then Joseph’s grave. The immutable One who is perfect and so could not change either for the better or for the worse, (Mal 3:6 ) nevertheless increased in stature (Luke 2:52 ). The perfect One was made perfect (Heb 5:9 ). The omniscient One who knew all men (John 2:24–25 ) and all things (John 16:30 ; 21:17 ), the One in whom are hidden all the treasures of wisdom and knowledge (Col 2:3 ), increased in wisdom (Luke 2:52 ), learned obedience through His sufferings (Heb 5:8 ), and submitted Himself to a measured ignorance (Mark 13:32 ). The omnipotent One (Job 42:2 ), the source of all strength (Neh 8:10 ), who commanded the winds and waves with a word (Luke 8:25 ), knew what it was to grow weary (John 4:6 ). The God who neither slumbers nor sleeps (Ps 121:4 ), slept (Luke 8:23 ). The perfectly blessed One (Rom 9:5 ), possessed of infinite joy (Heb 1:9 ) and impassible, was a man of sorrows (Isa 53:3 ), experienced the trouble of soul (John 12:27 ), breathed the sighs of grief (Mark 8:12 ), wept at death (John 11:35 ), and mourned over man’s sin (Matt 23:37 ). 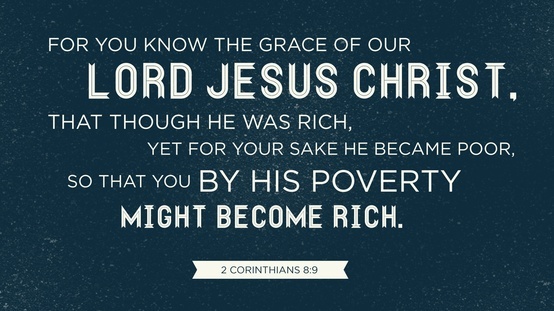 Consider that the One who was rich, enjoying the heavenly worship of the saints and angels, nevertheless for your sakes became poor, that you through His poverty might become rich (2 Cor 8:9 ). The One who owned the cattle on a thousand hills (Ps 50:10 ), whose Father’s house has many mansions (John 14:2 ), nevertheless had no place to lay His head (Luke 9:58 ). Consider that the bread of life come down from heaven, who out of His infinite fullness satisfies the hunger of every soul who feasts upon Him (John 6:35 ), knew what it was to became hungry (Matt 4:2 ; 21:18 ). The fountain of living waters (Jer 2:13 ) who invited the thirsty to come to Him and drink (John 7:37–38 ) and never be thirsty again (John 4:13–14 ), knew what it was to become thirsty (John 19:28 ). Consider that the Truth (John 14:6 ) was falsely accused of bearing false witness (Mark 14:56–59 ). The Healer who virtually banished disease from Israel in His ministry (Matt 8–9) bore our griefs (Isa 53:4 ) and was wounded for our transgressions (Isa 53:5 ) . Consider that the Majestic King of kings (1 Tim 6:15 ; Rev 17:14 ; 19:16 ), worthy of all honor and glory, was mocked, spat on, and beaten (Matt 26:67–68 ). Man’s Judge (John 5:22 , 27 ; Acts 17:31 ) was judged by man to be deserving of death (Mark 14:64 ). The Author of Life (John 1:4 ; 5:26 ) died (Acts 3:15 ). The fountain of all blessedness, infinitely worthy of all blessing (Matt 3:17 ; Heb 7:26 ), became a curse for us (Gal 3:13 ). And all of this was for us. The incarnation was designed to bridge the infinite chasm between God and man that existed by nature—insofar as God is by nature infinitely higher than man—but also which was doubly compounded by our sin. Man had sinned against God, and so man must make atonement for sin. But we are absolutely powerless to do so! Only God can atone for sin! And yet only man’s sacrifice would be accepted on behalf of man. And so in the infinite, marvelous wisdom of God, God became man! For there is one God, and one mediator also between God and men, the man Christ Jesus, who gave Himself as a ransom for all, the testimony given at the proper time (1 Tim 2:5–6 ). Therefore, since the children share in flesh and blood, He Himself likewise also partook of the same, that through death He might render powerless him who had the power of death, that is, the devil, and might free those who through fear of death were subject to slavery all their lives. For assuredly He does not give help to angels, but He gives help to the descendant of Abraham. Therefore, He had to be made like His brethren in all things, so that He might become a merciful and faithful high priest in things pertaining to God, to make propitiation for the sins of the people (Heb 2:14–17 ). This admirable conjunction of diverse excellencies in Christ was designed to rescue you from the sin which enslaves you. If you do not know the Christ of Christmas—this admirable Savior in whom this peculiar glory of juxtaposed perfections is displayed—I urge you to turn from your sins and trust in Him for your righteousness. I urge you to receive the best Christmas gift you’ll ever get: Christ Himself (2 Cor 9:15 ). Stephen Charnock wrote, “What a wonder that two natures infinitely distant should be more intimately united than anything in the world . . . that the same person should have both a glory and a grief; an infinite joy in the Deity, and an inexpressible sorrow in the humanity; that a God upon a throne should be an infant in a cradle; the thundering Creator be a weeping babe and a suffering man; [the incarnation astonishes] men upon earth, and angels in heaven” (Works, 2:150). Dear Christian, does it still astonish you? Can you slow down the holiday hustle and bustle long enough to let your mind ponder these astonishing truths? to let the eyes of your heart fix their gaze upon the glory of the Person of the Lord Jesus Christ? My prayer for you this Christmas is that you would do just that. That you would take these truths and turn them over in your mind—like Mary, to treasure these things and ponder them in your heart (cf. Luke 2:19 ). And that your heart would be stirred to worship God in Christ for the peculiar glory of the incarnation. For then, and only then, are you truly celebrating Christmas.